I am at the moment lying on my sofa all cuddled up next to the radiator sipping mulled wine while writing this post. I am revelling in being very warm and toasty as I have been out all day in the very, very wet and cold – having a lovely time but in very inclement weather! I really need some new boots as my winter ones seem to have a leak so will be shopping for new waterproof ones later this week. 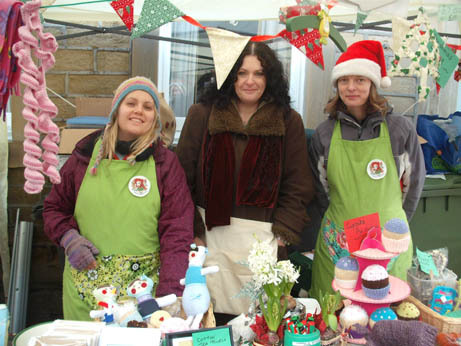 I have been out for most of the day at Honley, one of our local villages, where our WI group had a stall to raise funds . Here we are looking a little bit cold (I am in the middle in my superwarm coat!) 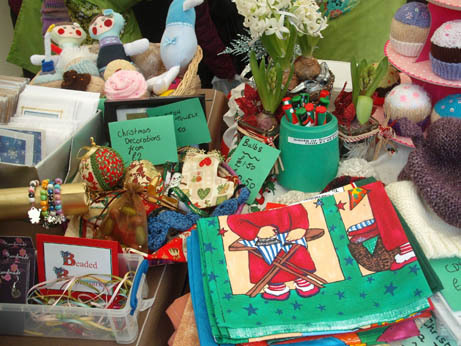 and here is our lovely stall – you may recognise some of my Xmas stuff on the table there. 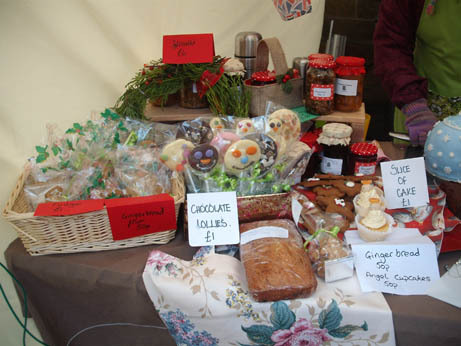 We did very well despite the weather so thank to everyone who came and bought from us. 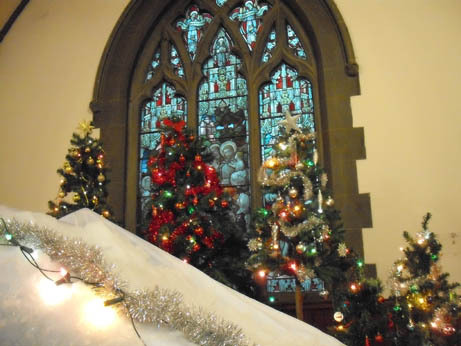 After that I went to one of the local Honley churches where they were having a Christmas tree festival. I have never been to one of these before but it is a fab idea, especially for Christmas decoration addicts like me. 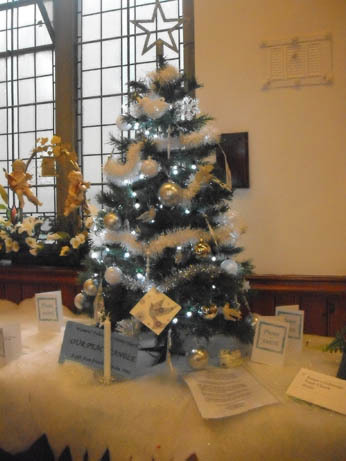 The idea is that local groups decorate trees in any way they like and there were about 40 different trees in this beautiful church, complete with a Santa’s grotto, cafe and arts and crafts for the kids. It was a wonderful display and a great fundraiser at £1 entrance – well worth it. I only got a few useable pics as the light was poor but it looked amazing. 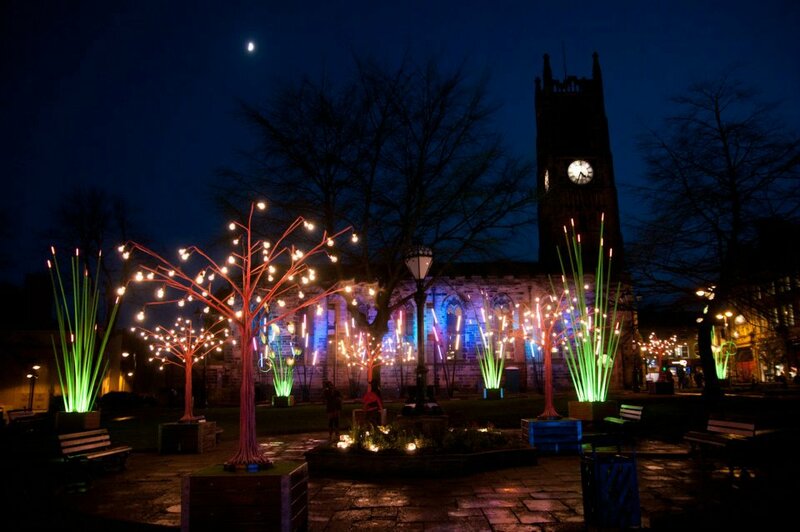 Then I went on to the Festival of Light in town with lots of wonderful light displays and entertainment and some very welcome mulled cider and wine.Camera had run out of battery by this time so here is one of the Facebook pics. All in all a very festive day. I am having a very festive lead up to Xmas this year as am visiting two more Christmas fairs over the next two weekends. I do love this time of year, I adore all the decorations everywhere and can’t wait to put all mine up next week. I am still making lots of stuff – some for selling at work and some in preparation for next year. I would like to do more Craft Fairs next year so thought if I start now I will have enough stock for more and might even get around to selling some on Etsy or Folksy as well.I have also started on the new Scandinavian style ones but have not had chance to take pics yet. Well I hope that you have a very lovely week ahead and don’t forget to go and comment on my blogaversay post if you want to enter the giveaway for ornies. A little pre- Christmas pressie for me! 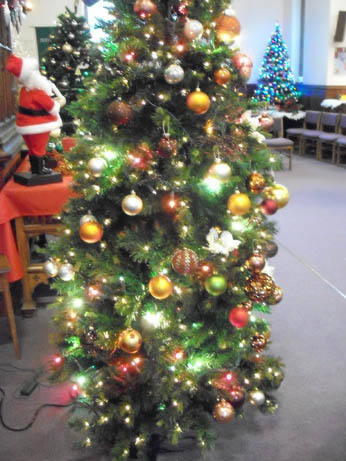 I love christmas tree festivals, they have one in whitby every year – its the old trees with a note saying “bought in woolworths in 1953 by my gran, priced two and six” that I find really touching.